One way to address this issue is to overlay bold transparent text or an image - called a watermark - on the image. By doing so, the image can not be used unless the user pays for the rights to use it. Adding watermarks is not a simple task. You could hire resources for manually watermarking using a photo editor . But, this process is not scalable for a massive photo gallery. Automating the process to add default watermarks to every image can make the process more efficient. Cloudinary, an end-to-end media solution enables you to simplify the watermarking process. 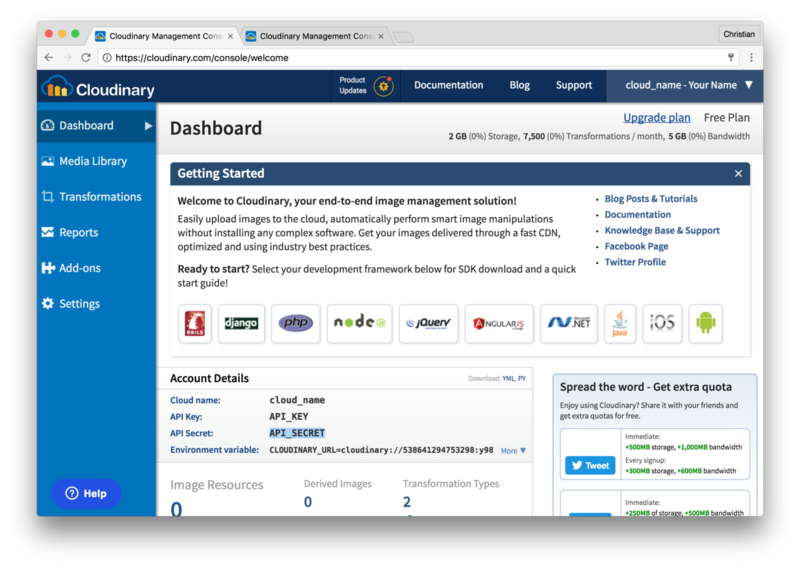 Cloudinary offers storage, manipulation and delivery of your images and videos as a service. Dynamic transformations enable you to manipulate media files either on upload or by adjusting the delivery URLs,. One of the transformations-- overlay -- can be used to watermark images. 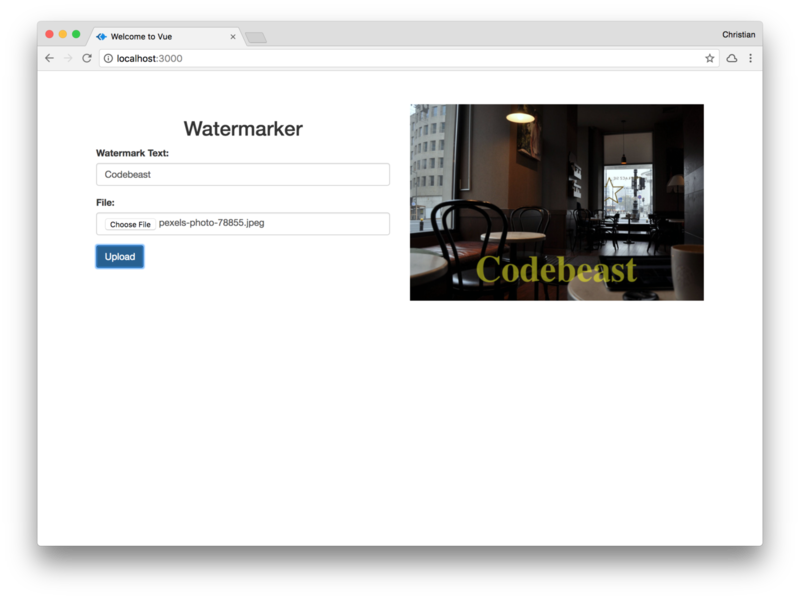 To see this in action, let’s build a Vue app to file upload to Cloudinary and creating a new watermarked version . Before diving into the Vue app, we need to provision the server/API, which the Vue app depends on to upload images. A simple Node server will do; thankfully, Cloudinary has a Node SDK to make our lives much easier. Connect Multiparty: Parse http requests with content-type multipart/form-data, also known as file uploads. Above is a POST route pointing to /upload. The route is configured with the multiparty middleware to parse uploaded files and attach to the req object. When this route is hit, we attempt to upload the image using Cloudinary's upload() method. It takes a file path, optional transformation argument and a callback function to be executed when the upload is successful. Color + Opacity: Color of the text. #FFFF00 is the color, while 80 attached at the end is the opacity value in percentage. The text is bound to a model, while the upload field is bound to an upload event handler. When the "Upload" button is clicked, the onSubmit method on our Vue instance will be called. There is also an image at the bottom of the template that its src attribute is bound to watermarked. This will be where the watermarked images will be placed. .ttf and .otf font types are supported. Make sure to include the file extension when referencing the public_id of the raw file. To make use of bold or italic font styles, upload separate font files for each emphasis style and specify the relevant file in the overlay transformation. A custom font is available only to the specific account or sub-account where it was uploaded. Underscores are not supported in custom font names. When uploading the font as a raw file, make sure the public_id does not include an underscore. As with any resource you upload to Cloudinary, it is your responsibility to make sure you have the necessary license and redistribution rights for any custom fonts you use. There are various techniques you could use for adding your brand logo or custom text as watermarks. 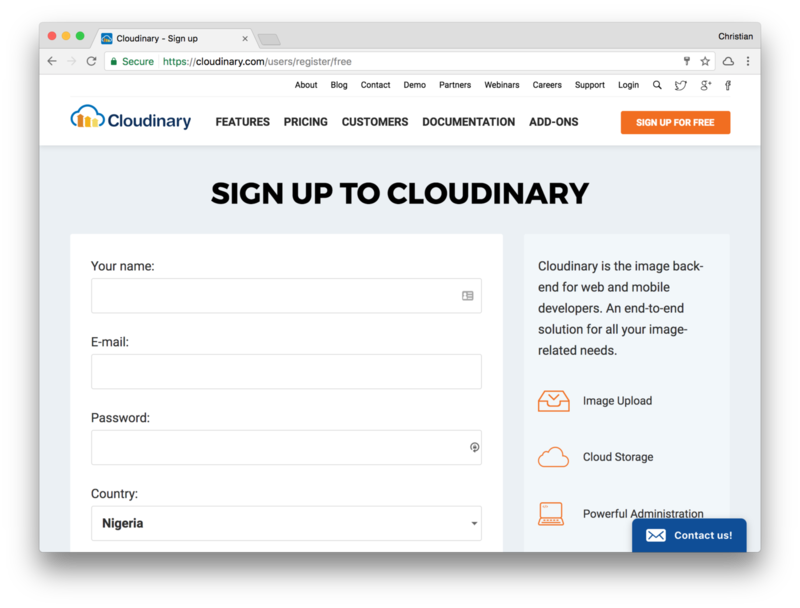 Cloudinary makes it easy to implement, automate and scale your watermarking requirements. Learn more overlay docs about different styling techniques and take it for a spin (for free).